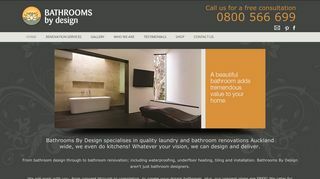 Bathrooms By Design – Bathroom design, remodeling and installation. Portfolio ideas and in-home consultations. Showroom based in Auckland, New Zealand. – Bathroom design, remodeling and installation. Portfolio ideas and in-home consultations. Showroom based in Auckland, New Zealand.